It is a great thing to begin the Christian life by believing solid doctrine. When people are always shifting their doctrinal principles, they are not likely to bring forth much fruit to the glory of God. It is good for young believers to begin with a firm hold upon those fundamental doctrines which the Lord taught in his Word. 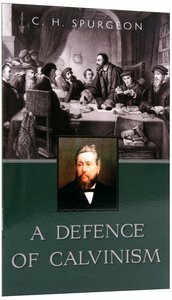 About "A Defence of Calvinism"